A Necessary Fiction extends Jeff Thomas’s engagement with image-makers who have used Indigenous people as the subjects of their work, interrogating the relevance of such work in light of today’s self-determination movement. Employing the work of both George Hunter and Edward S. Curtis as a catalyst, Thomas presents an alternative to the hegemonic and static narratives they both construct and reinforce. 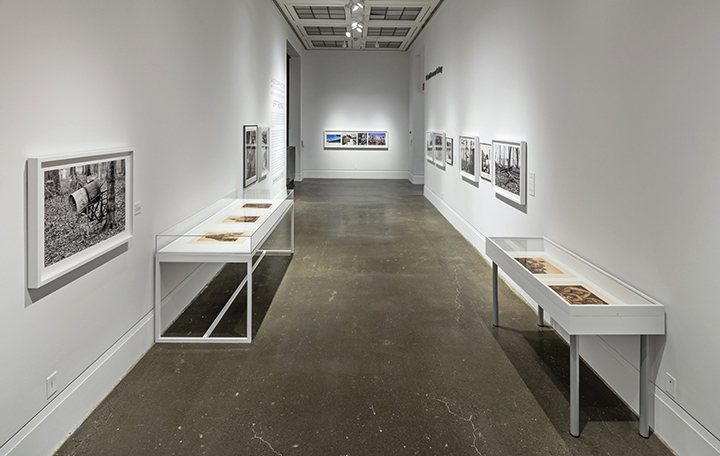 Thomas explores the role such archival images have played in the quest to de ne his place in the world, and aims to reshape the space of the gallery and the collections held therein into a locus for reimagining both the representation and lived experience of Indigenous peoples. A Necessary Fiction, Robert Freeman Gallery, Art Gallery of Mississauga. Photo by Toni Hafkenscheid. Banner image credit: Jeff Thomas, Bert General, Six Nations of the Grand River, pigment print on archival paper, 34 x 26 inches (detail).